Upper School programs are committed to nurturing knowledge and vision in our students by providing a quality Christ-centered education. 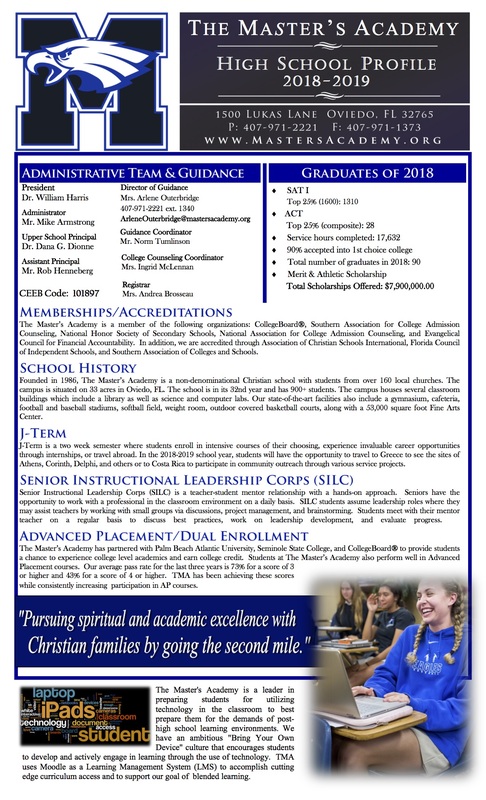 The Master's Academy desires to optimize the learning experience during the Upper School years to the betterment of the child, his family, community, and to the glory of God. As a partner with loving and conscientious parents, TMA continues to offer a Christ-centered education founded upon the Holy Scripture which fosters spiritual development and instills the vision and practice of Christian excellence in academics, character, and service to others. The Master’s Academy has partnered with Palm Beach Atlantic University, Seminole State College, and the CollegeBoard to provide students of all academic abilities an opportunity to experience college level academics and earn college-credit.